The nuclear energy response for mitigating global climate change across 18 participating models of the EMF27 study is investigated. Diverse perspectives on the future role of nuclear power in the global energy system are evident in the broad range of nuclear power contributions from participating models of the study. In the Baseline scenario without climate policy, nuclear electricity generation and shares span 0–66 EJ/year and 0–25 % in 2100 for all models, with a median nuclear electricity generation of 39 EJ/year (1,389 GWe at 90 % capacity factor) and median share of 9 %. The role of nuclear energy increased under the climate policy scenarios. The median of nuclear energy use across all models doubled in the 450 ppm CO2e scenario with a nuclear electricity generation of 67 EJ/year (2,352 GWe at 90 % capacity factor) and share of 17 % in 2100. The broad range of nuclear electricity generation (11–214 EJ/year) and shares (2–38 %) in 2100 of the 450 ppm CO2e scenario reflect differences in the technology choice behavior, technology assumptions and competitiveness of low carbon technologies. Greater clarification of nuclear fuel cycle issues and risk factors associated with nuclear energy use are necessary for understanding the nuclear deployment constraints imposed in models and for improving the assessment of the nuclear energy potential in addressing climate change. 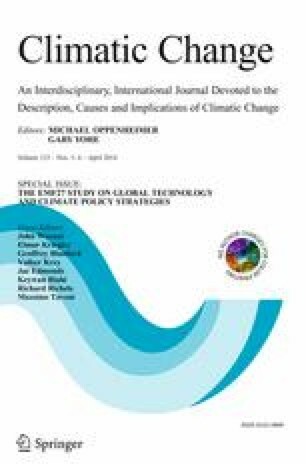 This article is part of the Special Issue on “The EMF27 Study on Global Technology and Climate Policy Strategies” edited by John Weyant, Elmar Kriegler, Geoffrey Blanford, Volker Krey, Jae Edmonds, Keywan Riahi, Richard Richels, and Massimo Tavoni. Son H. Kim’s contribution was supported by the Office of Science of the U.S. Department of Energy as part of the Integrated Assessment Research Program. The Pacific Northwest National Laboratory is operated for DOE by Battelle Memorial Institute under contract DE-AC05-76RL01830. The views and opinions expressed in this paper are those of the authors alone.